In addition to mouthwatering recipes, The Vermont Non-GMO Cookbook includes profiles of pioneering organic Vermont farmers, chefs, and non-GMO artisans. It will take you on a culinary adventure throughout the Green Mountain State, from Ben & Jerry’s homemade ice cream to internationally inspired Kismet Kitchen to the busy Butternut Mountain Farm. Supported by rustic food photography, it will awaken and inspire your palate to the exciting options being offered by Vermont’s burgeoning local, organic, and non-GMO food scene. The Vermont Non-GMO Cookbook is a 2018 Readable Feast Cookbook Awards Finalist. A division of W.W. Norton & Co., Inc.
Small, independent farms are the lifeblood of Vermont’s agriculture, from the sweetcorn grower to the dairy goat farmer to the cheese maker whose locally sourced goat milk chevre becomes the heart of a new dish by a chef in Montpelier. While this farm-to-table cycle may be a phenomenon just hitting its stride in the United States, it has long been away of life in Vermont, part of the ethos that Vermonters use to define themselves. As such, Vermont exemplifies a standard of small-scale, community-minded, unadulterated agriculture that has become a national model. When Tracey Medeiros wrote Dishing Up Vermont in 2008, she wanted to showcase the chefs and restaurateurs who were dazzling taste buds with their fresh, whole-food creations. 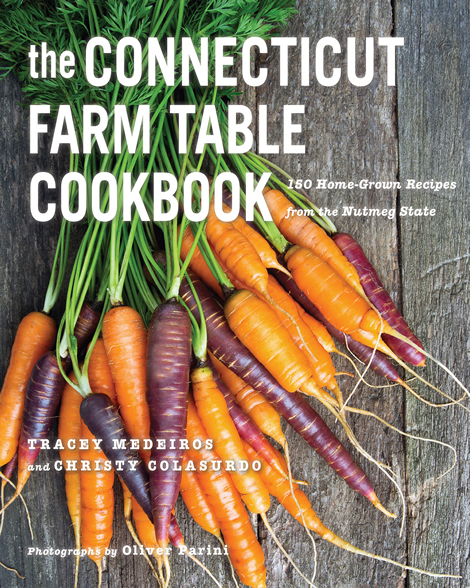 With The Vermont Farm Table Cookbook, Medeiros has traversed the Green Mountain State once again, in search of not only those celebrated chefs but the hard-working farmers who provide them with their fresh and wholesome ingredients as well. 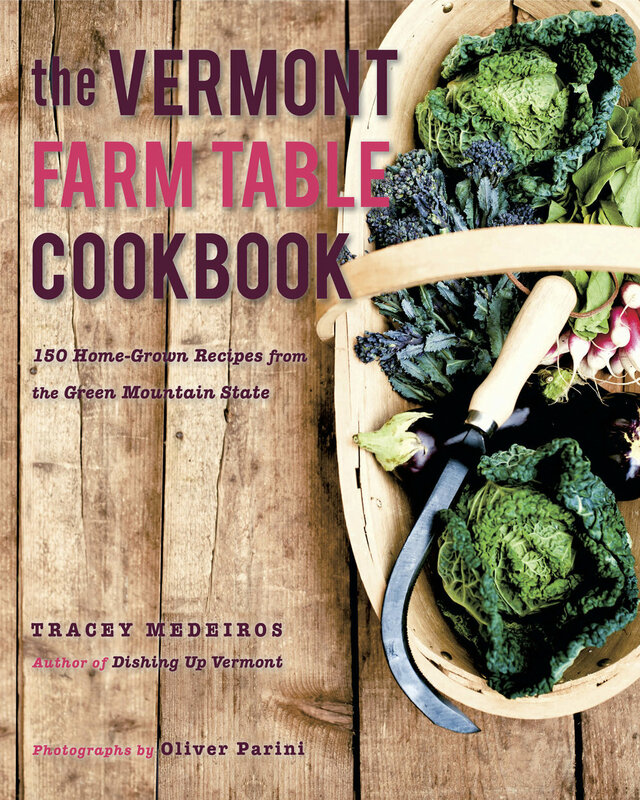 Collecting their stories and some 125 of their delicious, rustic-yet-refined, Vermont inspired recipes, Medeiros presents an irresistible gastronomic portrait of this singular state. Classics like Vermont Cheddar Soup and exciting innovations like Ramp Dumplings or Raisin Hell Pie will send you racing to your local farmers’ market in search of the ingredients. And with dishes that shout “only in Vermont,”like Wood-Fired Blueberry Pizza or Beer-Battered Fiddleheads, no matter where you are you’ll want to transform your tried-and-true menus into fresh and flavorful Vermont farm table suppers. The sharp tang of cheddar cheese and the earthy sweetness of maple syrup are Vermont's signature flavors. But they're just the tip of the Vermont food pyramid. Dairy farms support cheese production that goes far beyond classic cheddars. Farmers coax an impressive variety and quantity of produce from land that’s buried under snow for many months of the year. Game animals, rabbits, and traditional livestock thrive on small family farms where the farmers are committed to using sustainable, organic methods. Taking advantage of this wonderful food are innovative chefs trained to bring out the best in their ingredients, B&B owners who take pride in their robust country breakfasts, and the farmers themselves who love sharing the recipes that make their products shine. Dishing Up Vermont, a collection of recipes from a broad range of cooks dedicated to sustaining and enriching local culinary traditions, celebrates the classic taste of the Green Mountain state with fresh interpretations of everything from blueberry pancakes sweetened with maple syrup to a savory tart made with onions, apples, and Grafton Cheddar. This insider's view of Vermont cooking is rounded out with profiles of the people and places that make the state’s food scene so exciting. Here are classically trained chefs, home bakers, farmers, winemakers, comfort-food cooks, beekeepers, orchard and sugar-shack owners, craft brewers, and all the other foodies who keep Vermont traditions alive while developing vibrant new flavor combinations that respect the integrity of the raw ingredients.